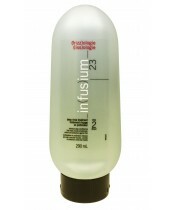 Shampoos, conditioners and trusted leave-in treatments from Infusium23 feature essential pro-vitamins and treatment ingredients. The Infusium23 daily regimen treats and helps restore damaged hair so it looks and feels noticeably healthy, shiny and manageable. Infusium23 is regularly recognized by the beauty editors of some of today's most influential, trend-setting magazines, including InStyle, Essence and SELF.